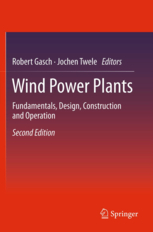 The book, edited by Robert Gasch, began as course notes for Gasch's popular course on wind turbine design for engineering students at the Technische Universität in Berlin. Many of the book's 15 authors are either graduates of or were members of TU-Berlin's Aerospace Institute. Though professor Gasch has retired, many of the other authors are significant figures in today's German wind industry. This edition is a much improved version of the 2004 edition. Wind Power Plants originally appeared in German as Windkraftanlagen. The literal translation of windkraftanlagen is "wind power plants." However the term wind power plant has a different meaning in English than in German, that is, a collection or array of wind turbines. Windkraftanlagen is more akin to "wind generator" or "wind turbine" in English. Disclosure: I initially proposed this book to MIT Press sometime in the early 2000s but later withdrew my participation. It was subsequently published in Germany. This review first appeared January 19, 2004. While it's difficult to pick one of the new engineering texts (there are two by John Wiley & Sons alone) as "best in the class," Gasch's book is clearly one of the best. Wind Power Plants includes numerous illustrations and drawings found nowhere else. This is in part due to the authors' location in northern Europe where the modern wind industry has its roots, and the authors long association with the early wind industry. The introductory chapter alone should be required reading for anyone entering the renewables field. It sets the stage for why wind energy is both important, and why wind is not the sole solution. Unlike many contemporary books on energy Wind Power Plants opening chapter looks squarely at population growth and growth in consumption of electricity. And on both accounts the USA compares poorly with other developed countries. The USA--the world's third most populous country with one of the world's highest per capita consumption of electricity--has a population growth rate rivaling that of China, and the USA's growth in consumption is nearly three times that of Germany. In fact Germany cut its per capita consumption from 1985 through 1995. Sobering. I'd go so far as to say that this chapter should be widely circulated among environmentalists, energy planners, and politicians in North America. The introductory chapter also provides a useful summary of the difference between environmentally-driven markets for wind energy and energy-driven markets, as well as a brief explanation of Electricity Feed Laws such as used in Germany and Spain. In a sign-of-the-times, this English-language version drops the chapter on vertical-axis wind turbines, adding instead a chapter on off-shore wind. Wind Power Plants is one the few if not the only engineering text with a chapter on wind pumping. And in the chapter on electrical generators is a section not only describing battery-charging wind turbines--the neglected sibling of professional designers--but also electrical resistance heating as in the University of Massachusetts Wind Furnace. Wind Power Plants: Fundamentals, Design, Construction and Operation by R. Gasch, J. Twele, et al., Springer Verlag, 548 pages, 432 illustrations, 245 x 170 MM (~6 x 9 inches) paper, 2012, ISBN 978-3-642-22937-4, €74.85. 5.1 How much power can be extracted from the wind?